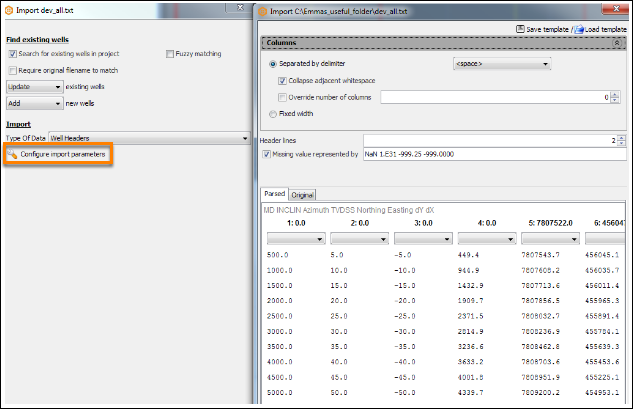 In addition to importing traces, checkshots, deviations and markers individually, all well data (OWX or ASC format) can be bulk imported into Insight. Insight will search for wells with a matching filename in the project and update them. Alternatively, new wells can be created from the imported well data. Select the OWX or ASC file and click Open. To find and replace an existing well, tick the Search for existing wells in project check box. Select the Fuzzy matching check box to find all the wells that have similar but not the exact file name. Select the Require original filename check box to find wells that have the same file name. In the following drop down boxes, select to Update existing wells and/or Add new wells. 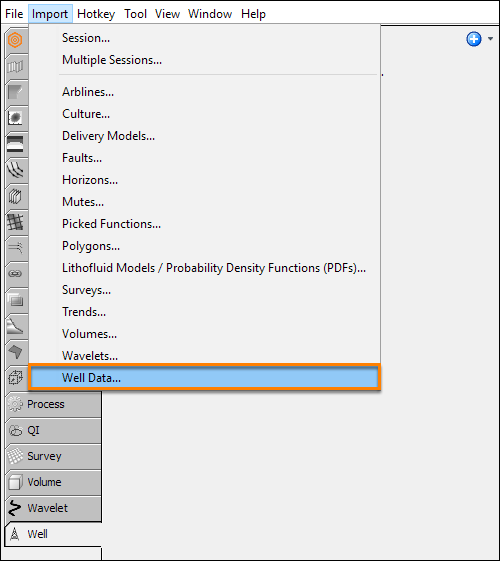 Insight will read the well data file and allow you to choose which data to import. Select the check boxes under Import. If the well file does not include a particular data, the check box will be grayed out. In the Units and Datums section, select the units and datum for MD and TVD. You will not be able to proceed until the units have been specified. Define the Depth Mode and Time units in the Checkshot Settings section. This is particularly important when transferring data between software (Insight works in ms). Finally, select the Offset Type relative to the previous point or to the surface location. Select the Types of Coordinates and convert the CSR if required (see Converting CRS When Importing a Well). The Import Summary window will appear to let you know if there are any problems with the import. Check the Details Panel of the well for more information on the warnings. When importing ASCII files (.dat or .csv) the user must configure import parameters separately. At the Import menu, click on the spanner icon to configure import parameters. At the column headers, click the drop-down box and select the header. When there are no more errors, the icon at the bottom will turn green. Click OK to import the well.